I trust that the 410’ high tower has no problems withstanding these kinds of actions. reactions and loadings at its top. I don’t think the biggest thing you have to worry about is the tension in that inclined cable. That looks like a pretty crazy lifting scheme to me. We would need much more info. on the entire problem, the load, the tower and its support system, etc. to make any meaningful comments. You’ve got a lot more than 400lbs. of compression on one side of the tower, from the lifting cable and from the inclined cable, hopefully not on one leg. And, a nasty lateral load at the top from the inclined cable. Slack off line 6 until it holds the load just out from hitting the tower and just hoist it up. What is line 6 for, is it holding up the tower? A 400-lb load should be maneuverable with a ground held tagline? No problem for top of the tower... we have tower structural analysis and good with 5000lb hoisting point at top. The purpose of the runner is 8ndeed to just keep the antenna away from the tower as it is raised. I generally agree that slacking that line as much as possible is probably best but tower contractor had indicated that it would just be anchored and tied. When i did some quick math... i figured that the tension in 3 would be just over 280 lbs to hold antenna at 20 degree. 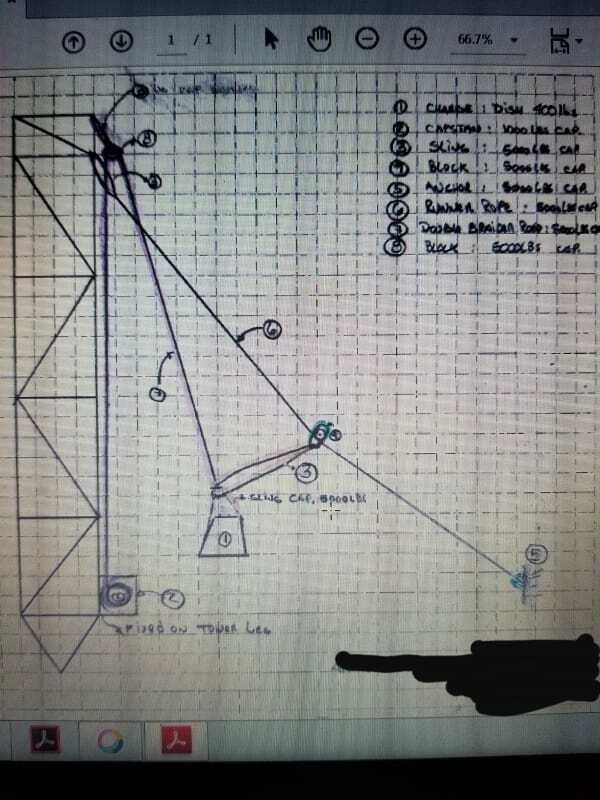 In order for the tension in 3 to not cause tension in 6 to exceed 5000lb limit... it looks like the line 6 must deflect slightly over 3 degrees at the pulley (had to assume rope was straight to start). 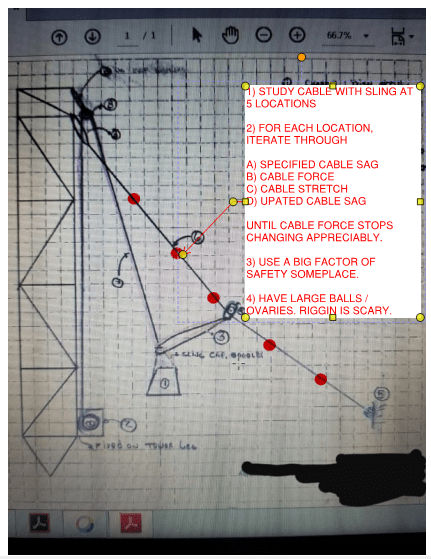 Given that static rope is rated for 3% extension at 10% of breaking strength... it seems that is lots to allow the rope to be tied off at 5 and hoisted as contractor suggested. Check with someone to be sure what that 5000lbs. hoisting point load at the top really means. Is that the cap’y. of block #8? What are the vert. max. loads, tension and compression, and what are the allowable induced lateral loads and moments; over one tower leg and/or split btwn. two legs. You have 800lbs. + (that’s 2 x 400) downward from the lifting rope on block #8. That inclined cable has the potential of inducing a fairly significant lateral load at the top of the tower, plus a downward component. Remember that a few hundred pound load perpendicular to the inclined cable puts a substantial harp or deflection in that cable, and that causes a fairly large cable tension.